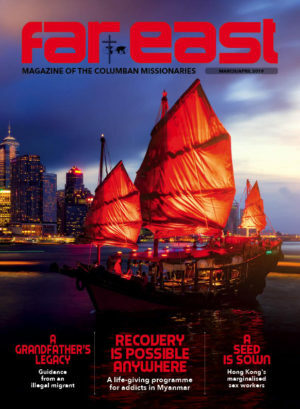 This is the third Columban article published by Independent Catholic News (ICN) on October’s Synod on Amazonia. The theme is taken from the Synod’s preparatory document. The author, Ellen Teague, is a member of the Columban JPIC team in Britain. “What was the most significant event in history?” Miss Cahill seemed agitated when she strode into the class for her lesson, and started pointing to each girl in turn, speedily going round the whole class. “The industrial revolution” the first blurted out, and this was echoed by the rest of that row. Halfway down the second row, with Miss Cahill looking displeased, one girl remembered how religious she was and said, “The Birth of Christ”. She seemed less severe. This response continued until all 30 girls had given one of the two responses. “Well I’m very disappointed,” said Miss Cahill, “that teenagers in a Catholic school don’t know that the Resurrection of Christ is the most important event in history”. Yet now, nearly five decades later, I wonder whether ‘The Industrial Revolution’ was a wholly inaccurate answer. It set the path for our modern industrial world. In 2015, with Laudato Si’, which is subtitled, ‘On care for our common home’, Pope Francis added his voice to the many who are critical of destructive models of industrial production and consumption which have wrought havoc upon the systems that support life on this planet. Indeed, he called for “ecological conversion” where human society reviews its notions of progress and learns again to value the natural world. In fact, over the last 200 years we have gradually moved into the ‘Anthropocene’ era, that is one where the world is largely shaped by humans. Many technologies human society has developed are doing enormous damage to the environment. The term was first used by a Vatican body in a 2011 document, ‘Fate of mountain glaciers in the Anthropocene’. We are changing the chemical composition of the atmosphere, causing human-induced climate change, polluting the water in our rivers and oceans, and the impact of humans on biodiversity is greater in the past 50 years than at any time before in human history. Between 10 and 15 million species share ‘our common home’ but the rate of extinction has been accelerating because of human activity. Linked to this is growing inequality and poverty, and poor communities are often forced to use the natural world unsustainably in order to survive. Over 140 million people have been forced to migrate in recent years because of climate change disasters: droughts, harvest failures and devastating storms. The UN believes the number of ‘environmental refugees’ could reach 300 million people by the middle of this century. The negative impact on the planet caused by human behaviour has now reached crisis proportions. The city of Beira in Mozambique was recently completely destroyed by a tropical cyclone, whose severity has been linked to climate change, and cities across Asia regularly experience toxic smog. More than 850 million people go hungry everyday, and this will only worsen with environmental degradation. Nowhere are these problems more apparent than in Brazil. Huge swathes of Brazilian rainforest are being cleared to make way for soy plantations and cattle farms, and to feed the timber industry, a situation likely to accelerate under new leader Jair Bolsonaro. Already, his government plans to open indigenous reserves to large-scale mining without indigenous consent. Rainforests are crucial in the fight against global warming, by absorbing carbon from the air, but if forests are cleared that carbon is released as carbon dioxide and other greenhouse gases. Brazil – which hosts about 42,000 plant species, 9,000 species of vertebrates and almost 130,000 invertebrates, also has an indigenous population of almost 900,000 people. They tend to have different values which protect nature better than Western societies. A 2017 study found that mining and its auxiliary activities caused 10 percent of deforestation in the Brazilian Amazon between 2005 and 2015. How much Amazon deforestation might skyrocket if indigenous reserves are opened to mining now is anyone’s guess; indigenous groups are currently the Amazon’s best land stewards. Brazil’s mining environmental and safety record is marred by frequent waterway contamination and land pollution, and includes two deadly tailings dam collapses in the past three years. Faith groups are supporting the indigenous people. 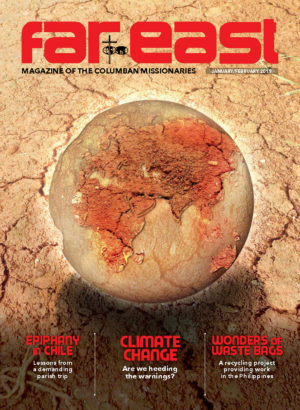 The Columbans have been prophetic over at least four decades, highlighting that the planet’s support systems are as overstretched as they are undervalued. Fr Sean McDonagh, who worked with indigenous people in the Philippines for two decades, wrote about this in the early 1980s with his first book, ‘To Care for the Earth’. Nature underpins all economies with the “free” services it provides in the form of clean water, air and the pollination of all major human food crops by bees and insects. And yet we forget this. Fr Peter Hughes, who works with REPAM, the Pan-Amazonia Ecclesial Network, and is helping the Network prepare for October’s Synod on Amazonia, warns that, “the ancestral wisdom constructed over generations of how to build a respectful and lifegiving relationship with a most difficult and hostile environment is now in danger”. Columbans support campaigns to hold mining giants to account, raise awareness about the importance of rainforests and biodiversity, and are now highlighting the Amazonia Synod. Columbans were represented at a conference last week in Washington to prepare for the Synod. They heard Archbishop Bernardito Auza, the Holy See’s Permanent Observer to the United Nations in New York, note that Pope Francis in his encyclical ‘Laudato Sì’, urges all to show special care for indigenous communities and their cultural traditions, not merely out of defense for their rights but in recognition of how much indigenous peoples have to teach the world about the inter-relationship between environment and sustainable development. Back in 2015 Columbans were at the 2015 Paris Climate talks, calling for a strong climate agreement to keep global warming below 1.5 degrees celsius. The Columban banner read, ‘Hear the cry of the Earth and the cry of the Poor’. 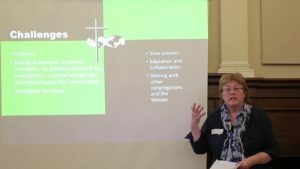 The Global Catholic Climate Movement continues to pull together Catholic groups with the same mission and its website has become a common source for campaigning and resources. And faith groups have been tackling consumerism and a rapid increase in the consumption of natural resources. Increased consumption means expanding agriculture and mineral extraction into crucial ecosystems such as the Amazon. This planet is the only one we have. It makes sense to take care of it and to ensure that it will continue to support us in the years to come. This is our real security, not putting our faith in weapons, particularly weapons of mass destruction, or in a future technological fix. In the Autumn faith groups will celebrate the Season of Creation and mark 1 September as a special Day of Prayer for Creation. The human community – including people of faith – is beginning to realise that we must make radical changes in the way we treat Earth if future generations are to inherit a planet that is healthy, beautiful and fruitful. Achieving this goal of living in a sustainable way will define the nature of Christian mission in the future, and eco churches and schools witness to this. Modern science and creation theology challenges us to move from an exclusively anthropocentric view of creation to a creation-centred one. St Columban, who in the 7th century had profound awareness of God’s presence in creation once said, “those who wish to know the great deep God must first study the natural world”. Much comes back to reviewing consumption beyond Earth’s finite resources, challenging the commodification of life, alongside practical initiatives to get back to working with life systems and not against them. It is a commitment to hand on to future generations of human beings the beauty and abundance that is God’s gift to us. And future generations are demanding now that their rights are recognised. And that’s why millions of schoolchildren worldwide, inspired by Swedish teenager Greta Thunberg, have been striking and marching to get rich nations to reduce their carbon emissions. We must no longer treat the future as a place to dump ecological degradation, technological risk, nuclear waste and public debt, and that we feel at liberty to plunder as we please. Ecological conversion involves acknowledging the Anthropocene reality and supporting ecologically sustainable patterns of production and consumption. Much of the remaining wealth of nature depends on indigenous people, who are on the frontline of the damage caused by a short-term and destructive model of development. They often know best how to conserve nature. Let’s listen to them during this year of the Amazonia Synod. And going back to that question posed to me in the classroom, future generations might well consider the end of the fossil fuel era and the transition to sustainable energy and environmental justice as a very significant event in history. In fact, saving our living planet.